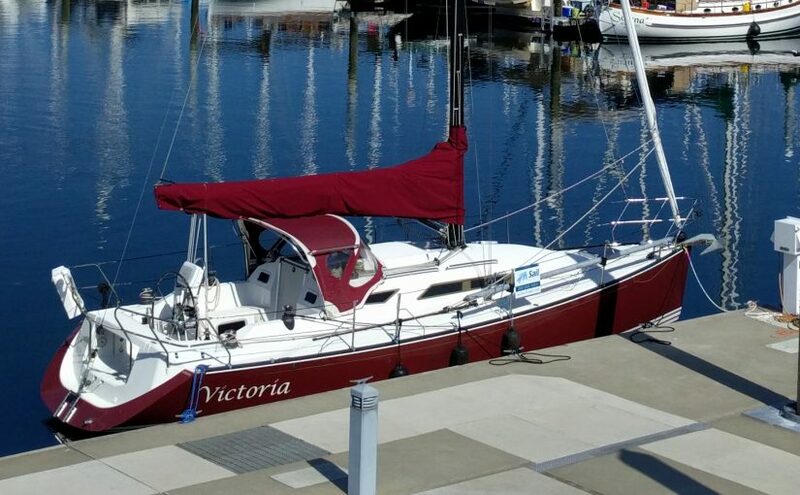 Victoria is a C&C 99 and was built in 2003. 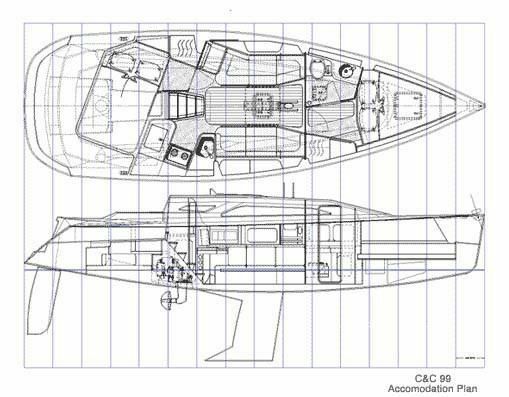 Here are some images of her and some details about the C&C 99’s in general. Link to youtube video of Victoria filmed when she was new. 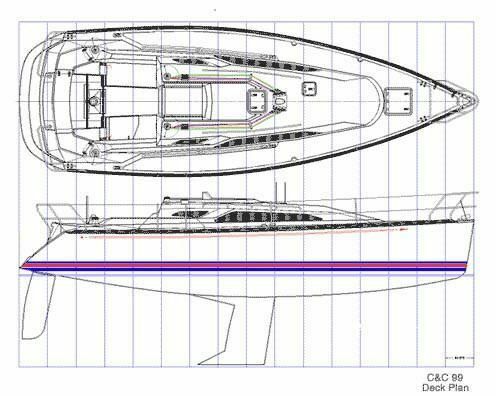 If fast is fun, then sailing a C&C 99 will be more fun than you’ve had in a long time. She’s a 32-footer that is race-ready with family and friends and cruiseworthy in civilized fashion, with undeniably rakish styling and a daring cockpit and deck layout. This is one sporty speedster…we’ll understand completely when you order your hull in fire-engine-red. 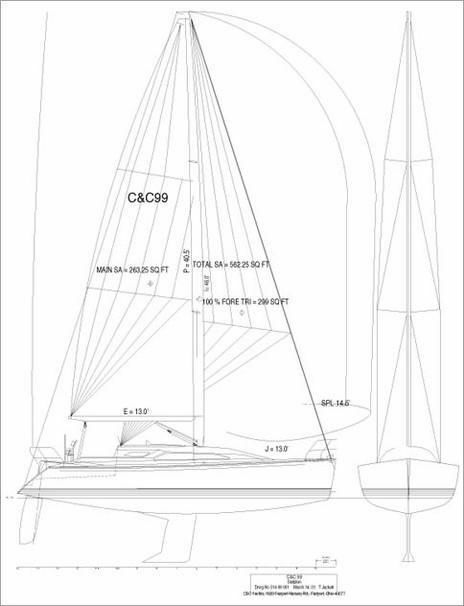 The sail area-to-displacement ratio is 21.5, the righting moment is 883 foot pounds per degree, the “J” (foretriangle) dimension is 13 feet, and the area of the spinnaker, courtesy of an oversize 14-foot, 6-inch pole, is 1,026 square feet. Other vital ingredients of the speed recipe include an easily-driven canoe body with minimum wetted surface; a near-plumb bow to maximize waterline; a deep, balanced spade rudder; a high-lift-foil keel for windward efficiency. Sailors all over the country have noticed how quick the C&C 99 is—she won her class at Key West Race Week, and both Cruising World and SAIL magazine selected the C&C 99 as one of the best boats of the year. Hull to deck joint is secured with 1/4-20 stainless machine screws installed on 4” centers through the full-length 6061 T6 aluminum backing plate imbedded in the hull flange. This method exceeds the recommended installation requirements of the ABS scantling for offshore sailing yachts. Composite light RTM match-molded deck locker hatches assure strict thickness controls allowing accurate gasket seal of cockpit openings. Conventional construction uses single-sided moldings with painted raw fiberglass underside. • Marine grade polymer lockable companionway hatch board.